#MeetTheMaker has taken a little break over the course of 2015. The Christmas special; where we met the maker of a beautiful crochet Christmas wreath was well received and so I am on the hunt for the creatives that we shall meet in 2016. First up is Raya Brown; textile artist and felt maker. She is introducing us to wool painting. Ever heard of that?! No me neither. Good job Raya is here on the Mrs Crafty B blog this week for the first #MeetTheMaker interview of 2016. Raya, it is lovely to meet you. Tell us, what is your favourite way to catch up with a friend? I love inviting my friends to my house and cooking a nice meal for them. It is more informal and we can relax and be ourselves there. I am a professional artist and a felt maker. I come from St Petersburg, a cultural capital of Russia, where I gained my degree in Fine Art and Textiles. I have been teaching Art and Textiles for over 18 years both in England and Russia. I am the founder of Magic Wool Studio and the main teacher there. About 10 years ago I discovered wool, its fantastic qualities and I saw a great potential for my future art work. I literally became obsessed with wool. I realised that I could create pictures and render various colour nuances and shades using merino wool. I saw that by layering wool fibres I could create amazing watercolour effects in my paintings. At Magic Wool Studio in Kidderminster I make wool paintings based on various themes including “Landscapes”, “Still -Life”, ”Flowers” and “Animals”. Exploring wool further I came across handmade felt. I realized how wonderfully versatile it is-you can create anything from sumptuous wall hangings and cushions to shaped and sculptured items. I make luxury hand felted accessories and clothes which you can see on my website. So felt making and wool painting are the main areas I have been exploring and working on for the last 10 years. The piece of work you are sharing with us is beautiful. Tell us a bit about it. 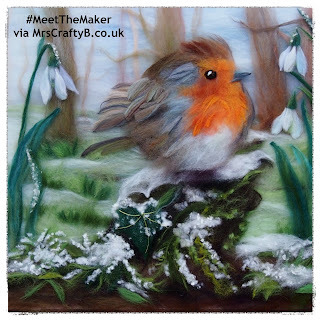 “The Red Robin with Snow Drops” wool painting This picture is not felted. I used a completely different technique to create it called “Wool painting”. This technique involves using layers of merino wool and enhancing it with silk and viscose fibres. Some people call it “painting with fibres”. This technique allows you to achieve amazing new colours and tones and create some watercolour effects. I have literally never heard of 'wool painting'. How and when did you learn this skill? The story is I visited my University friend in Russia about 10 years ago and was fascinated by one of her paintings. When I saw it from the distance I did not understand what materials or techniques she used. When I had a closer look I discovered that the picture was made with textile fibres. I got really inspired and was determined to learn this technique called “wool painting” myself. I attended a few workshops in Russia and realised that it was something that I really wanted to develop and use in my further work. I found a way of channelling my love of painting in a different way, while still achieving my goal of (rendering beauty and harmony of the surrounding world) reflecting the beauty of the landscape and all the subjects which inspired me. My wool paintings as I call them are just that, a way of placing the strokes of coloured fibres as one would place the brushstrokes. The results are strikingly rich in colour and texture and the layers that I create with fibres allow me to convey different planes or grounds such as - background, foreground and middle ground in my work. So what inspires and motivates you? Inspired by my mother who is a famous watercolourist in Russia, I have always been fascinated by colour, its numerous shades and tones, its strength and subtlety. I also love nature and I get a lot of inspiration from it. Where do you like to craft? I love to make crafts at my studio called Magic Wool Studio. I can disappear their and absorb in the magical world of wool and felt. Do you have any crafting tips? Believe in yourself. We are all artists deep inside and Art is about expressing yourself in your own way. It is the way of communicating your own thoughts, feelings and hopes to the surrounding world. Enjoy the process as well as the end result. Also share it with your friends and family. Do not create for yourself only. It will give you so much pleasure showing your creations to people and giving your work to them as presents. Aside from my website you can find me on Facebook. What big plans do you have for the next 12 months? Right, an all new quick fire round! You're working on a project, what is on in the background? I always create lots of sketches before I make a final item. So I will have sketches and photos (sometimes) from which I work. My favourite items are a Lilac Shawl and a Lilac Nuno felted Bag which I made especially for my husband’s brother’s wedding. They are a perfect match to the blue dress that I love and I wore it at the wedding. Three things that make you happy? Being able to make Art work which brings happiness and good emotions to people’s lives. Well Raya, it has been a pleasure hosting you on the blog. I shall be popping over to find you on Facebook now. Thanks so much for allowing us a good nosey into your world!